The recent news of the copy of Saint Botolph's Review formerly owned by Ted Hughes being acquired by the British Library was welcome. And for the sake of this blog post, which has been in the works & in the queue since February, the timing could not have been better. For it involves the location of Sylvia Plath's copy of Saint Botolph's Review. Touché! The Small Special Collections Library at the University of Virginia has eight books formerly belonging to Sylvia Plath. Of particular note is that this repository holds Sylvia Plath's copy of the Saint Botolph's Review, of which an image is featured below. Like Hughes' copy, there is a some kind of liquid stain on the front cover. Though we know Plath bought her copy from Bert Wyatt-Brown on or near Queens Bridge on Silver Street, did the stain happen before or after she "got drunk, very very beautifully drunk" on the evening of 25 February 1956? I have long wondered where this copy was, have you? The note attached to the bibliographic record reads, "From the library of Sylvia Plath, with her signature on the dust jacket, and Hughes' manuscript corrections to ['Fallgrief's Girl-friends']." This title, and the seven others, forms part of their formidable Clifton Waller Barrett Library of American Literature Collection. 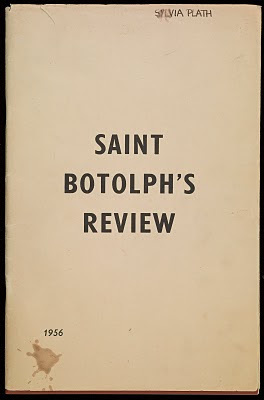 Additional copies of Saint Botoph's Review are rare. The British papers pointed out that three additional copies are known to be held in UK libraries at Cambridge University, University College of London, and Oxford University. In addition to UVA, copies held in the US can be found at Emory University and University of North Carolina at Chapel Hill. No copies are known to be held in Belgium. Wyatt-Brown published "Ted, Sylvia, and St. Botolph's: A Cambridge Recollection" in The Southern Review in Spring 2004. A very special thanks to angelictenderbutton who visited the library and facilitated obtaining of an image. This is amazing Peter. As soon as the press started reporting the location of Hughes' copy, I wondered immediately about Plath's. How odd they both have wine stains on them! The image here is wonderful too, thank you. Thanks Anonymous. I felt like it was a significant find. Like I said, I had always wondered where it was. I wonder if Luke Myers gave the copies to Bert to sell, hence the wine? you are so welcome, Peter!